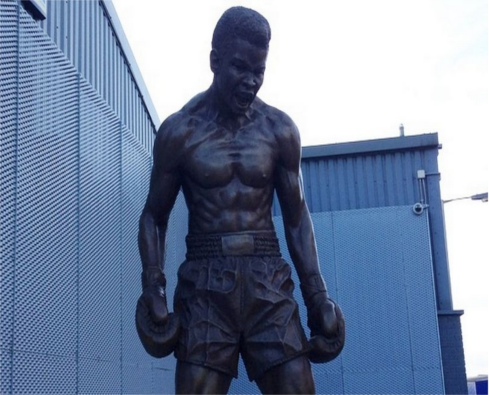 A new statue of Muhammad Ali has been erected in Liverpool’s Baltic Triangle. It is now McKeown Rice Exhibition space - a plinth reserved for art on Jamaica Street. The bronze statue is named ‘The Greatest’ and was made by artist Andrew Edwards and struck at the Castle Fine Arts Foundry. It celebrates the legendary American boxer, who died earlier this year and once famously said “you ain’t no fool if you from Liverpool”. Chris Green, Operations Manager at Baltic Creative, which rents out the plinth, said: “He’s one of the most iconic sporting figures of the 20th Century. Ali is the fifth piece of art placed on the Baltic Triangle plinth since the creative project started two years ago. Previous exhibits include ‘Black Swan’ by Kenny Hunter and ‘Days of Judgement’ by Laura Ford.